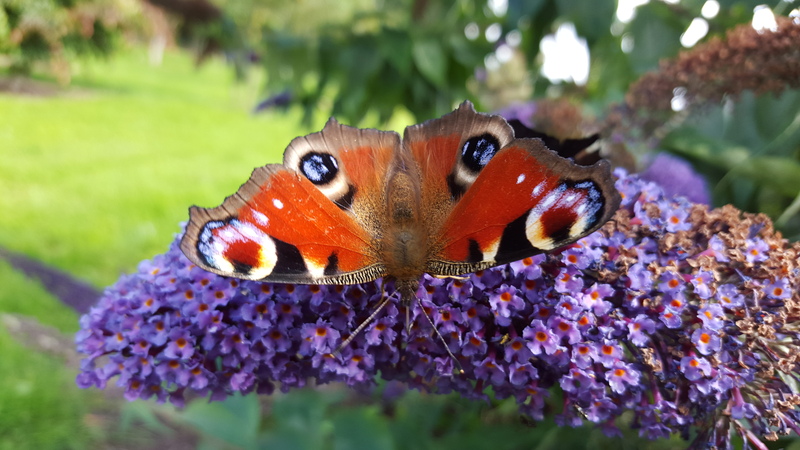 First of all Lá Fhéile Pádraig Sona Daoibh. Wishing you a Happy St. Patrick’s Day. I will be celebrating my nations National day by judging a St. Patrick’s Day themed cake challenge and partaking in an Irish dancing lesson organised by the wonderful Sports and Social club at work. How fitting to post something green today. Enjoy. 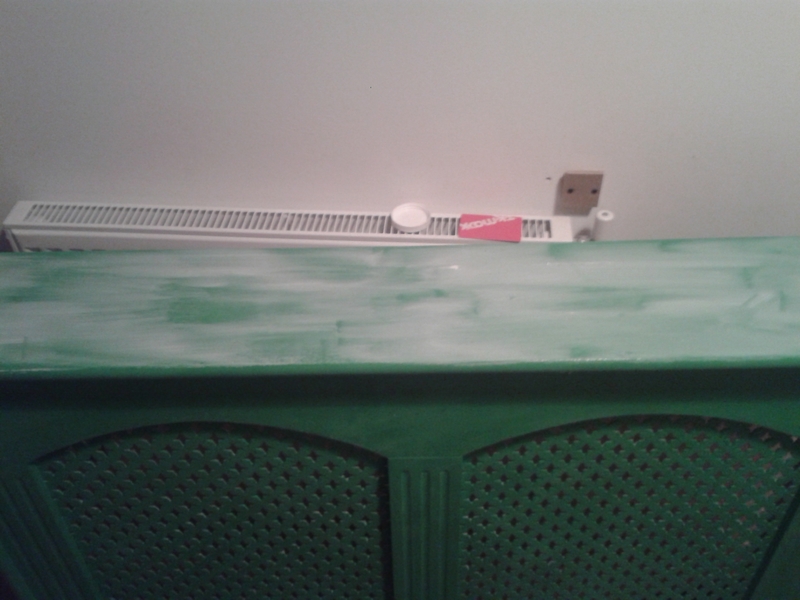 So I decided to paint ANOTHER piece of furniture in Antibes green. 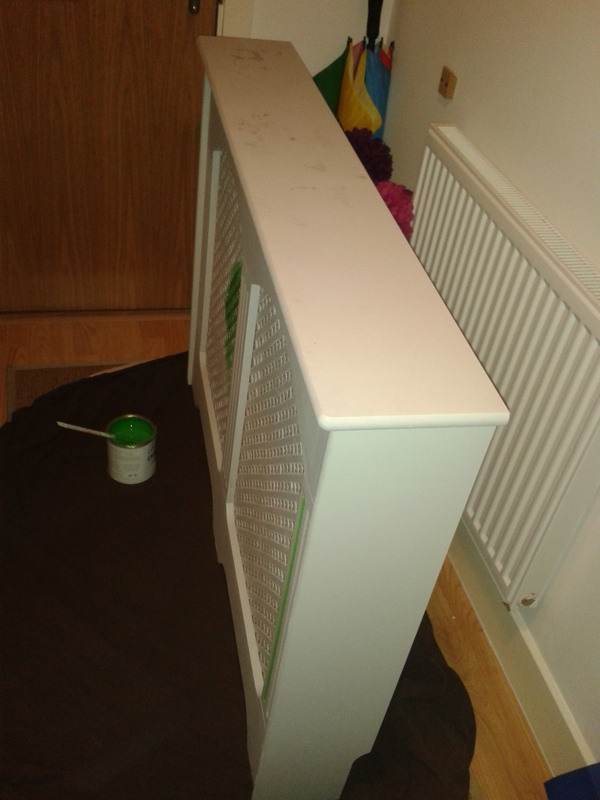 We have a radiator cover in our hallway that we bought in a local big DIY store as an unpainted flat pack. 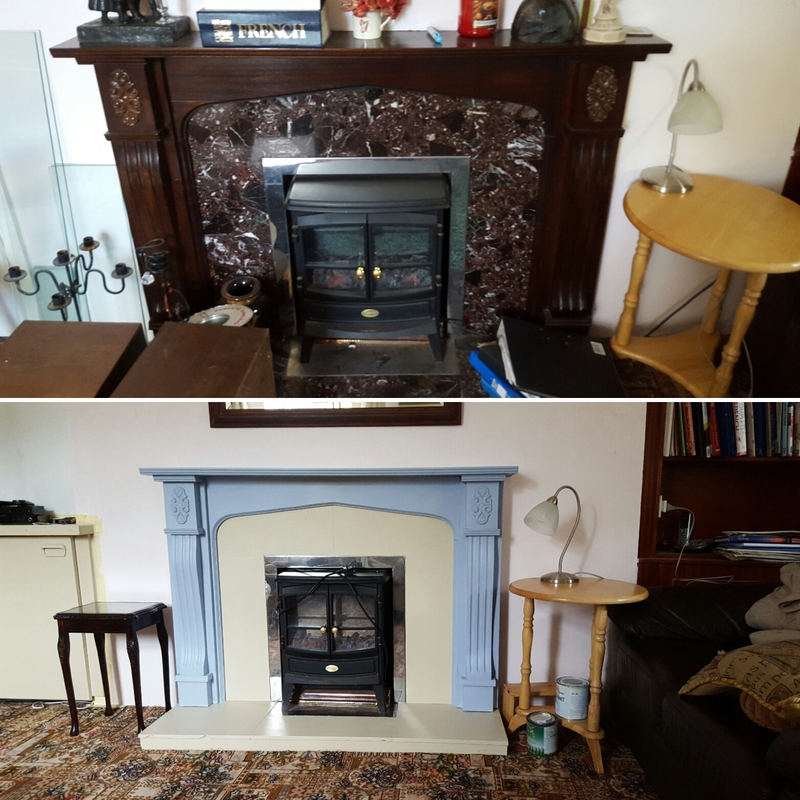 I first painted it grey. BOOM! SOOOO much better in green. TIP alert! When painting something like this use diagonal strokes across the piece. You waste less paint that way. I had a fair bit dripping down the opposite side before I figured this out. So the main painting is done. (one coat, it needed two plus wax) And this is where I stopped for a while. I later got the idea about the top of the cover. So actually sometimes a bit of time between finishing projects can be a GOOD thing. (tell that to your partner next time you are half way through a project that you said you would finish two weeks ago). 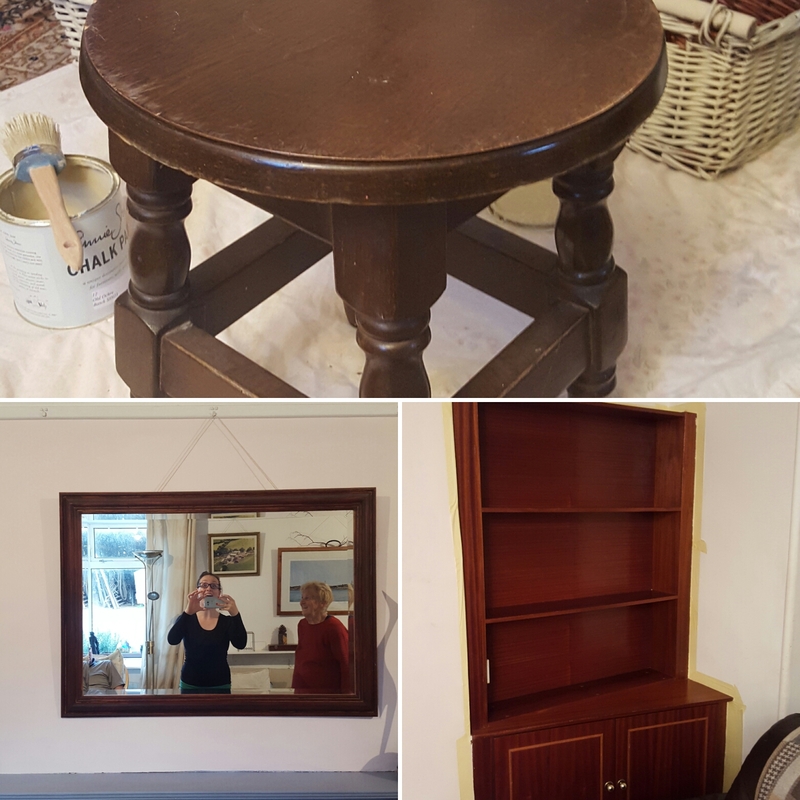 I have done several pieces of furniture with Annie Sloan chalk paint and the tops have not all stayed as pristine as I would like. 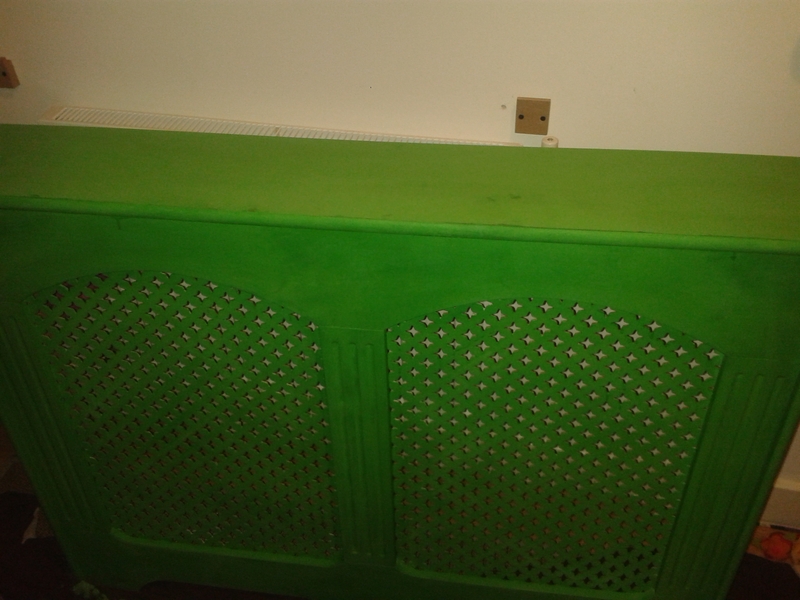 A hallway radiator cover is going to see a LOT of traffic in its lifetime. So I decided I needed to protect it with more than just paint. 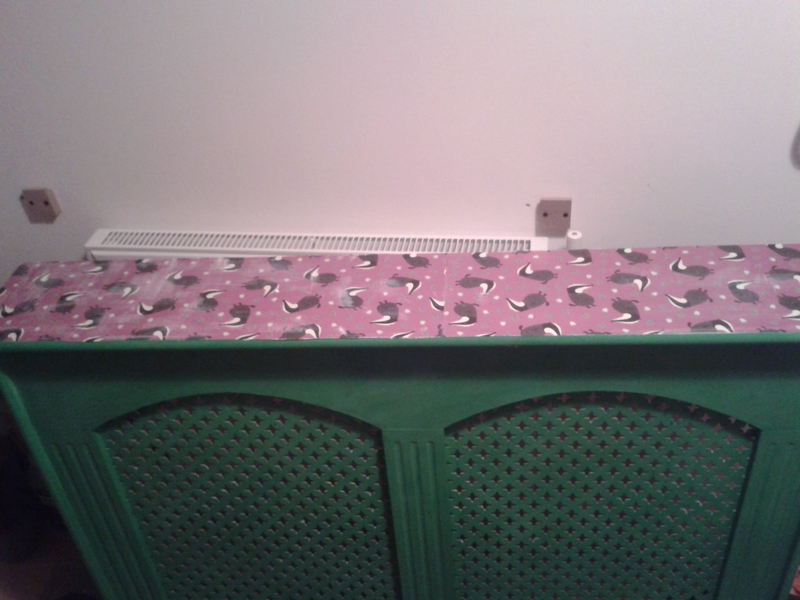 I have used mod podge on a previous project (as yet unfinished completely – 3 years later ooops!!) Mod Podge without getting too technical is a type of glue sealant thing. (I said it wouldn’t be technical) I found a good explanation here: http://easycrafts.wikia.com/wiki/Mod_Podge Anyway! I had to buy mine on Amazon a few years ago due to it not being available in the UK. I don’t know if you can get it now. I digress… Anyway! I decided on paper plus mod podge. 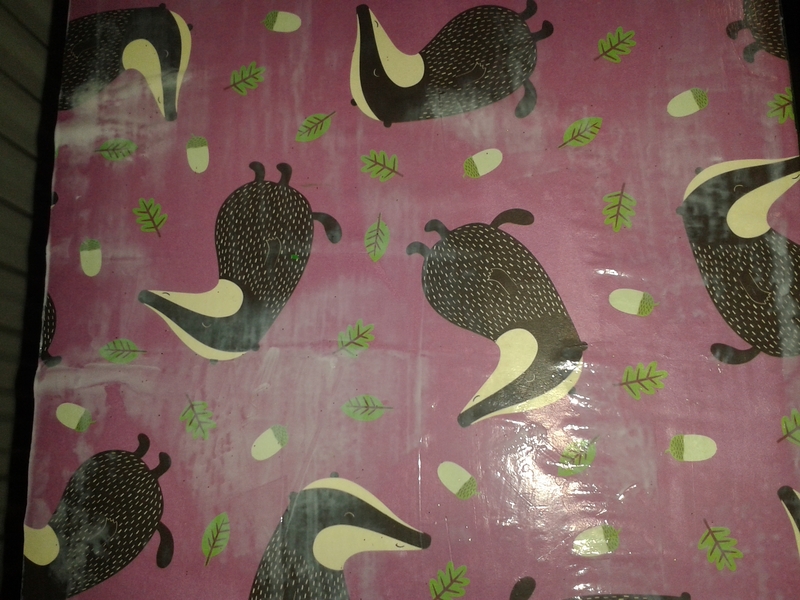 I found a beautiful piece of wrapping paper with badgers and the same colour green acorn and sycamore leaves as the radiator cover. Cute and quirky, just how I like it. Pretty paper, mod podge (I used the matte version but there are LOADS of different types of finishes available), a paint brush, a card. A used gift card is useful. If you use a credit or debit card you will get glue all over it and may never be able to take it out of your wallet again. Which if you are trying to save money might be a good thing but you have been warned…. Measure out how much paper you need. 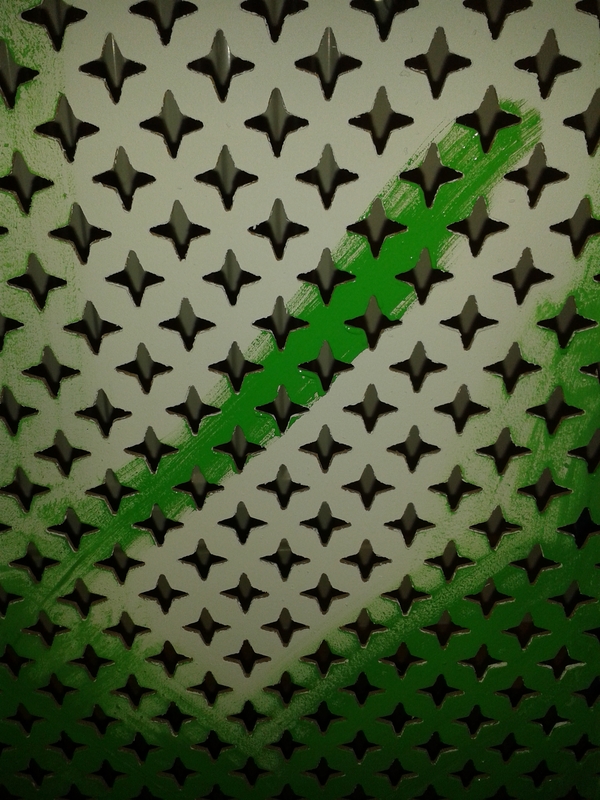 Unfortunately, the pattern repeat on mine was impossible to match. I probably should have bought two sheets to match it correctly but that would be a lot of wasted paper. And to be honest it didn’t cross my mind to check until I was at home and crafting. It didn’t really bother me so I just carried on. If this bothers you, think about pattern repeat beforehand. Put the paper on top and crease down the side so that you know where to cut. Cut the paper to size. Make sure you know which piece is going to go where. Because once you get the glue on you need to move quite quickly. Paint on a layer of mod podge with your brush like so…. Then carefully lay the paper on top, using the card to push out any bubbles. Then seal the top of the paper with another layer of mod podge. Once again using a handy used gift card, smooth out all the bubbles, or if you are feeling rebellious your credit or debit card – Just kidding DON’T DO IT!!! 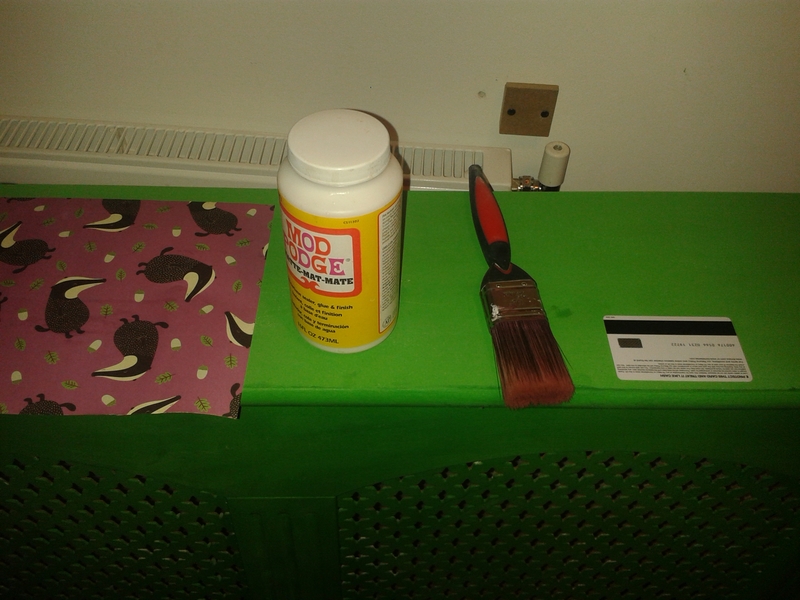 unless you are TRYING to save money and you don’t WANT to be able to get your cards out of your wallet… In this pic you will see some of what I mean, to the left of the pic there are little bubbles at the edge where I have pushed them out from the middle. Keep pushing and it should stick ok. You might need to add a little more mod podge underneath (use the card to get it in) this should properly stick the paper to the wood. There is no natural light in my hallway so the chances of good pictures (taken on my phone) are slim. But you get the idea. 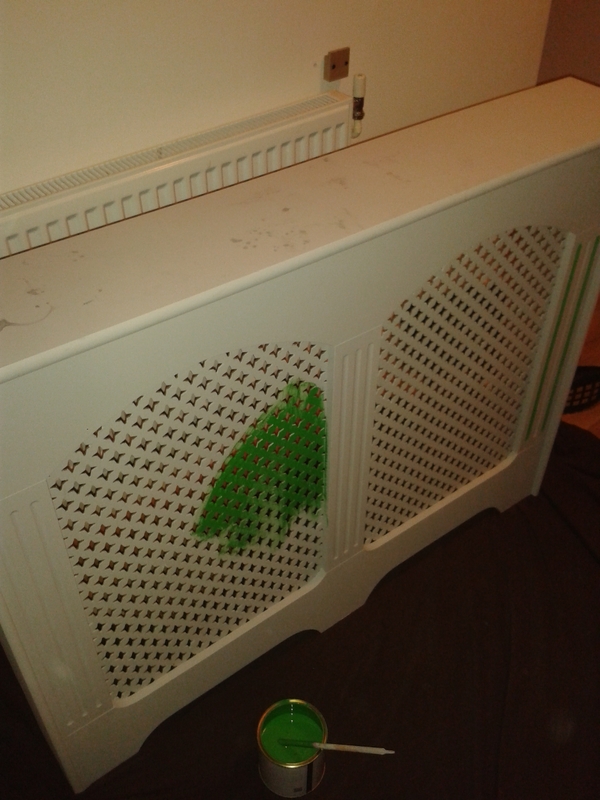 I LOVE my new radiator cover. As does my husband and daughter, phew! A nice little piece of personality when you enter the home. PS. Remember to clean the glue out of your brush. DON’T get lazy and leave it in the sink thinking “I’ll do that a bit later” because you know what glue does? It hardens and this will ruin your brush. Not that I did that or anything. Of course not. 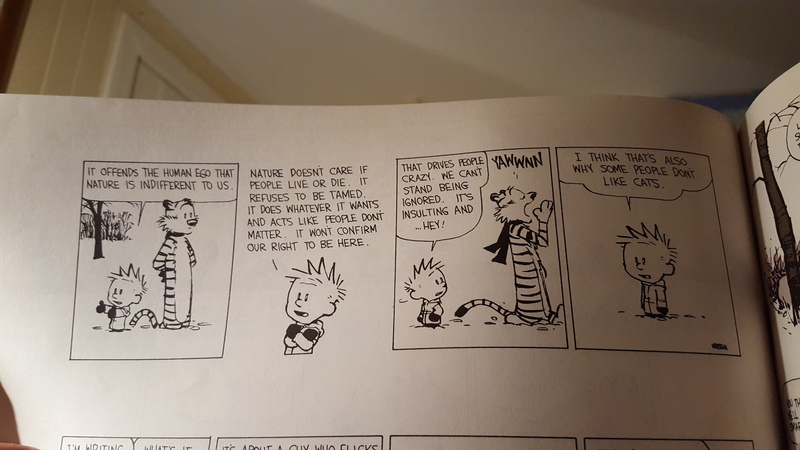 Ahem…. We are in the middle of a home makeover. As is the way, there are several projects on the go. But at the moment the focus is the master bedroom. It sounds so fancy doesn’t it? It’s just the main bedroom in a two bed flat but it is the MASTER bedroom so that is what I will call it. 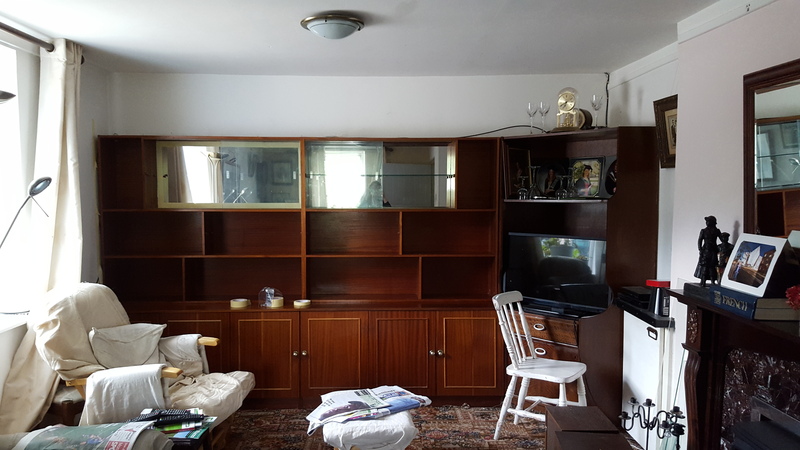 Before we moved into our lovely 2 bed flat we sold a lot of our old furniture. We have been slowly gathering pieces that are more “us”. One thing we haven’t changed is the bed. Beds are EXPENSIVE. Our bed has moved with us for the past 7 years. 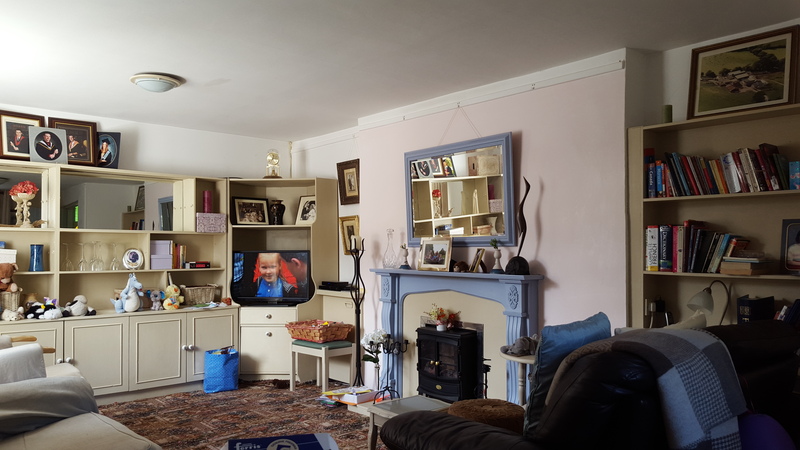 It is still in perfectly good nick but it is ugly! I LOVED it when we first bought it of course. But now not so much…. 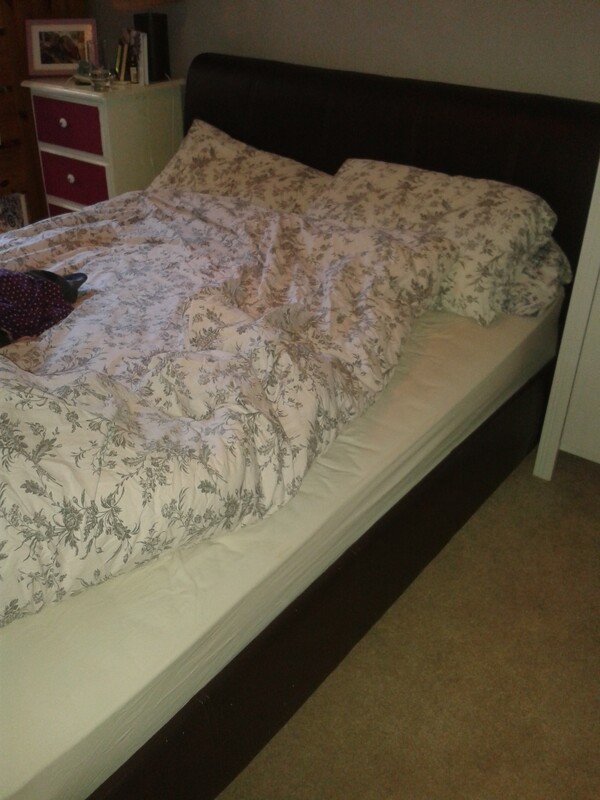 So, I spent a long time trawling through pinterest looking for bed makeovers. I found some lovely pics and some tutorials. 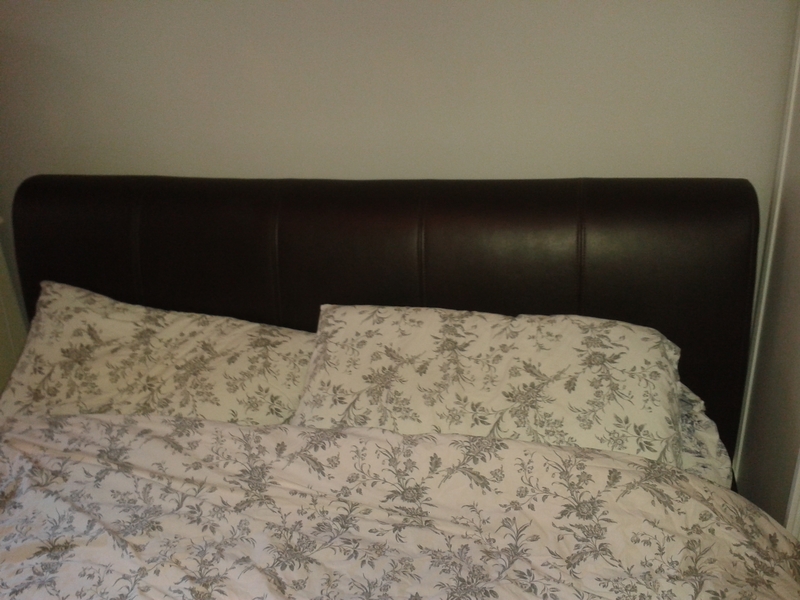 I first thought I would cover the headboard with a cream linen fabric. But looking into it there was a lot of work in that so I got lazy and shelved that idea. 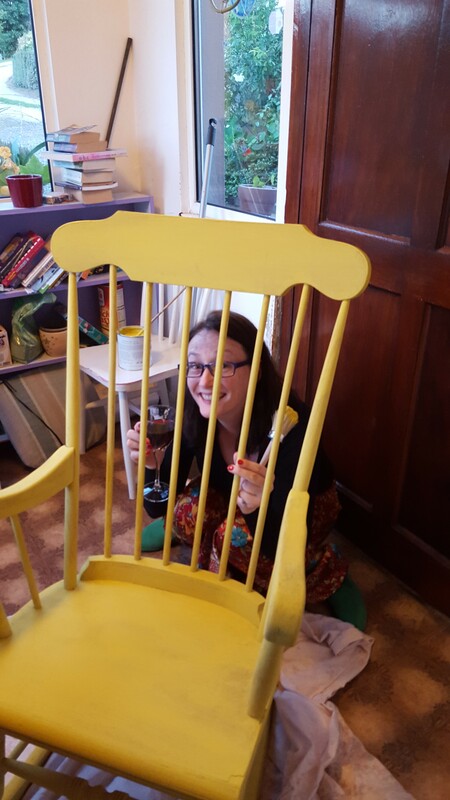 I discovered Annie Sloan chalk paint last year. (I am not affiliated with the brand I just LOVE it) It appeals to me because of two things. One – the colours. Beautiful rich colours. I have used antibes green, paris grey, greek blue, henrietta, emperors silk and aubusson blue. The second reason I love it is the ease of use. There is no prep required! 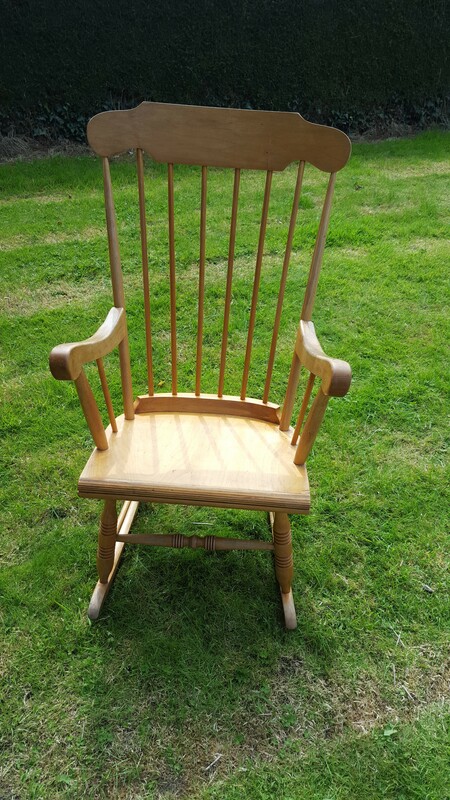 No stripping of varnish, no sanding, just dust off your pieces and off you go! Before now I have only painted wood. I saw a few tutorials on pinterest showing the possibilities of painting on fabric and leather. 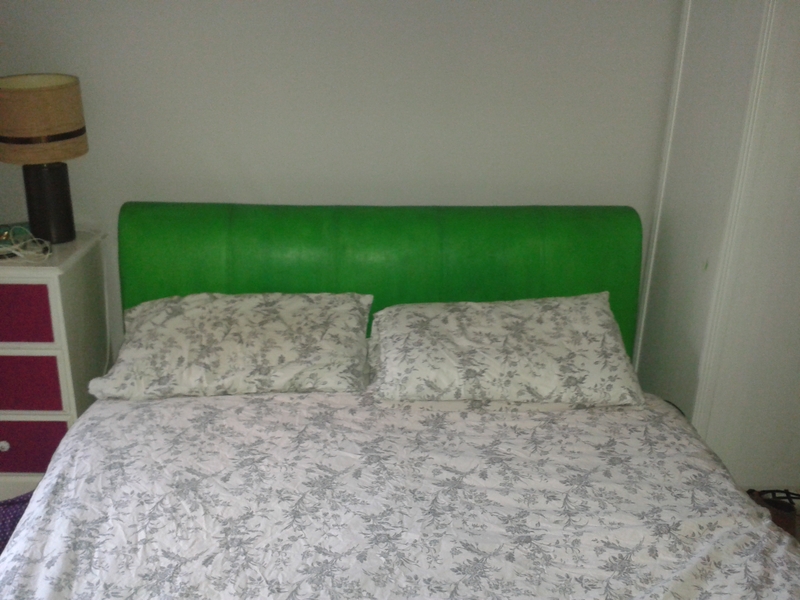 I finally decided that I would have a go at the bed. 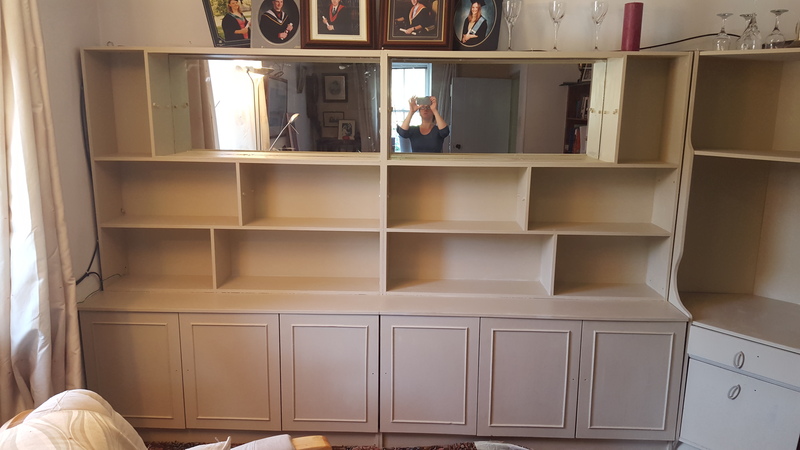 I went out to my local supplier – http://www.michaelkeehan.co.uk/ – another reason to love the paint. Annie Sloan ONLY sells to small distributors. You won’t find the paint in large super stores. I discussed the project with a lovely lady there who told me that she had previously painted a saddle!!! Not for use afterwards but as a feature. That was the nail in the coffin. I restocked on my clear wax (I ran out after painting my daugthers bed, kitchen table, 4 kitchen chairs, large ikea storage unit, 4 picture frames and a large storage cabinet oh and a small collapsible side table) A little goes a long way…. 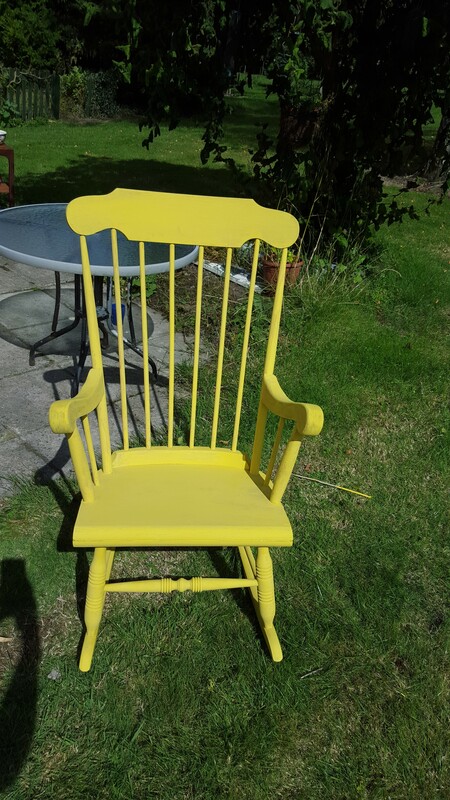 I bought another tin of antibes green (previous used on said kitchen table, chairs, side table and 3 of the 4 picture frames) as well as a few testers – old white and english yellow. I went a little CRAZYYYYYY!!!! Oh and a tester of the dark wax….. Shhhhhh! I must say the photos don’t do it justice. The lighting isn’t great and I took them on my phone. But you get the idea. I also must say my husband was not a party to my painting plans. 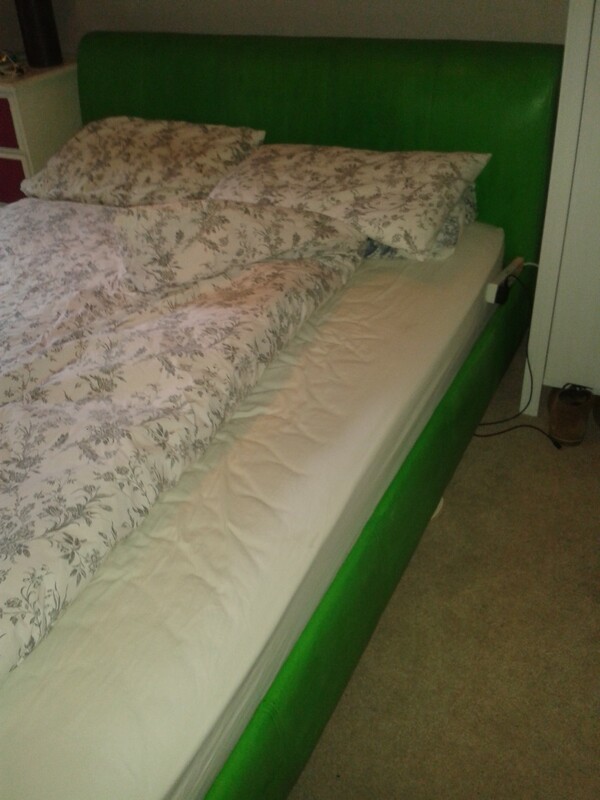 I had vaguely mentioned about painting the bed but nothing definite. He came home and it was half painted. But he was very enthusiastic about it. Phew!! I wonder what I can paint next….